We’d love your help. Let us know what’s wrong with this preview of Crazy by Linda Vigen Phillips. Laura is a typical fifteen-year-old growing up in the 1960's, navigating her way through classes, friendships, and even a new romance. But she's carrying around a secret: her mother is suffering from a mental illness. No one in Laura's family will talk about her mother's past hospitalizations or increasingly erratic behavior, and Laura is confused and frightened. She finds Laura is a typical fifteen-year-old growing up in the 1960's, navigating her way through classes, friendships, and even a new romance. But she's carrying around a secret: her mother is suffering from a mental illness. Listening to Linda at the Colorado teen lit conference 2015 Do you Skype with school classes? What would you say this book would be rated: PG, PG13, R? Linda Phillips I imagine it would be PG13 because of the theme of mental illness. Novels in verse are always so impressive to me - to tell a story with poetic language is no easy feat. CRAZY follows Laura as she battles her own feelings about her mother's mental illness. I loved how she found her own peace with it through art. A thought provoking and poignant read. Honestly, I never really loved books in poetry formatting, but it fit really well in this one. Laura was relatable. I really felt connected to her. She was annoying sometimes, and rather dramatic, but generally I felt that she was so REAL. Laura thought about things, played with ideas, and in turn, decided against it. Flashes of suicide, constant thoughts that just infiltrated her life, her outlook. I felt like I was in her head, and she wasn't insane, the way she thought, the things that haunted her. She was scared. Terrified. Unsure. And I love the way that it just coated your tongue. On the downside, there was talk of "religion" both Lutheran and Catholic, neither very accurately/actually portrayed, and in the end Laura says bye to God. Which is sad, because with the fears and troubles and struggles she had in her life, she would never find peace without Him. But I guess that's what you're gonna get from someone with a non-Christian worldview. Overall, I recommend this to Christian girls 15 and up who know where real Peace lays. This is a beautifully poignant novel of verse spanning a year in the life of Laura, a teenager whose mother suffers from mental illness. Anyone who has experienced mental illness personally or through the life of a loved one will be able to relate to the raw emotions experienced by Laura. I was deeply moved by the honesty captured within these pages and left with a feeling of hope and thankfulness for medical advancements, great friends, and strong support systems. There is so much I want to say This is a beautifully poignant novel of verse spanning a year in the life of Laura, a teenager whose mother suffers from mental illness. Anyone who has experienced mental illness personally or through the life of a loved one will be able to relate to the raw emotions experienced by Laura. I was deeply moved by the honesty captured within these pages and left with a feeling of hope and thankfulness for medical advancements, great friends, and strong support systems. There is so much I want to say about this book but my words seem insufficient to convey what I feel. ***SPOILER ALERT*** Can you imagine the pain you would have to go through living with someone who has a mental illness? Well this book shows you just how you would feel. This book is in the genre fiction. I loved this book because it shows the pain fifteen year old Laura goes through. Lauren is growing up in the 1960's so there's no good remedy to help her mom get better. Laura's mom has a mental illness. This causes her mom to behave weirdly such as throwing objects at Laura, staring out a windo ***SPOILER ALERT*** Can you imagine the pain you would have to go through living with someone who has a mental illness? Well this book shows you just how you would feel. This book is in the genre fiction. I loved this book because it shows the pain fifteen year old Laura goes through. Lauren is growing up in the 1960's so there's no good remedy to help her mom get better. Laura's mom has a mental illness. This causes her mom to behave weirdly such as throwing objects at Laura, staring out a window as if shes waiting for something or somebody, and make horrible artwork even though she used to be great at making art. Laura blames herself for her moms behavior. She also is afraid that she will turn crazy just like her mom. But Laura still has to deal with other things like in school she has this crush on a guy who is rumored to be a player but she doesn't believe the rumors. Laura has been made fun of for her white spots. Whenever she gets nervous they appear on her neck. Laura's mom having a mental illness changes Laura by making her be stronger and know how to handle a bad situation. The title relates to the book because it is titled crazy which her mom is. The narrator is a bit unreliable because Laura is still trying to figure out her life while everything is going on. When her mom was going crazy Laura decided to run away. Her running away caused her to feel better. It also made her be able to calm down and take a breather from her situation. I was surprised when Laura decided to run away. I didn't think she would go that far. I was also surprised when Laura came home to her mom screaming and throwing objects at her. I was satisfied when Laura's mom went back to her normal self before she went crazy. I liked how the author created many unexpected events in the story. Laura's dad's actions were not believable when he left his wife home alone with the possibility of her going insane. And she did end up going insane. I rate this book five stars because the surprising events were really unexpected which made me not want to put the book down. I would recommend this book to someone who is going through a tough time because it might make them see a more positive side of the situation or at least some sense of hope. This book will make you question how insane you are and I would strongly recommend everyone to read this amazing book. It has been my great joy and privilege to walk alongside of Linda Phillips over the last fifteen years as she has crafted her debut YA novel, CRAZY. From reading the first twenty poems in which Linda poured out her anguish as a teen struggling with her own mother's mental illness; through watching Linda add, subtract, and organize these poems into a story arc at the 2009 Chautauqua Highlights Writing Workshop we attended together; through hearing the up's and down's of finding her agent and publisher; to now actually turning the pages and savoring the poems--it's almost as amazing as watching the birth of a child! Now I have the opportunity to share with you some of my favorite poems and parts of this book. I've read some of these phrases several times and they still catch my breath for their simple beauty and sensory imagery; others surprise me as if I've just discovered a new treasure. Without further ado, here are some gems from CRAZY. thinking my cheeks were so hot they must be leaving a trail of smoke. "Why don't you take up painting again?" admiring the pleasing arrangement she created when she was fourteen. "Oh, I could never get back to that,"
propped against the door frame. "Hail Mary, Other of God…." finally getting Mama to sit down in her rocker. Here is Linda reading one of the next poems, "Nervous Breakdown." As the book progresses, Laura wrestles with her own demon: her fear of being as crazy as her mother. With the encouragement of two new friends--a local gift shop owner who "stands out like an art piece herself/in a shift dress full of helter-skelter bright colors,/dangly earrings,/and the most beautiful long gray hair/I have ever seen" (p. 148); and her crush, Dennis, who pushes Laura to "dig for answers/don't run, dig"(p.272); Laura discovers the work she must do to discover the truth about herself and her family. There are two things this review of CRAZY cannot do. First, I can't communicate how proud I am of Linda's accomplishment and how wonderful it is to see this book in print. In a previous blog I compared myself to a mid-wife but that's not quite accurate. Linda is like a sister to me. Since CRAZY is her baby, I guess that makes me a proud aunt. and she loves me very much. as anything I have ever done. Sad but interesting story based loosely on the author's life. Beautiful imagery! CRAZY does not shy away from the difficult issues revolving around mental illness, but embraces them in a moving and informative story. 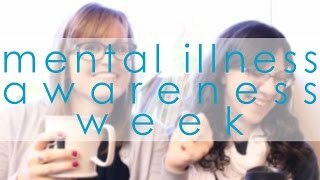 Due to the severe stigma regarding mental illness at the time, Laura's mother's illness is kept a secret from others and is unacknowledged by the family. Not only that, but Laura’s mother does not receive the treatment she needs until after she has a particularly bad manic episode, scaring her husband into action. CRAZY also brings to light the flaws of the medical practices for mental illness during the time, such as the memory loss from shock treatments and the foggy haze of over medicating. Even though today is nowhere near as bad as it was during the 1960's, mental health care and societal attitudes are still not what they should be. Insurance refuses to pay for a good deal of treatment, and there are still those who look down at people for something they can't help any more than someone can help having cancer. CRAZY not only shows its readers the flaws of history, but illuminates what we still need to improve upon today. As someone with OCD and depression, this is a message that I not only relate to, but thoroughly appreciate. Another important theme in CRAZY is how mental health not only affects the ill person, but all of their loved ones as well. Laura is often lost and in pain because of her mother's illness and feels she has no one to turn to. As the story progress, Laura loses her passion for painting and finds herself contemplating suicide. While reading the novel, I felt deep sympathy for Laura. And as I turned each page, I hoped that she would find happiness within herself despite her difficult home life. By the end of CRAZY, Laura finally comes to terms with her mother's illness and even forces her family to acknowledge it. She learns that she cannot control her own mind any more than her mother can, and let’s go of the fear that she will become crazy like her mother with the help of her mother’s kind doctor. “You’ve been through a lot for your years. Make it work for you going forward. Keep asking questions, demanding answers, and calling the beast by the name.” (Pg. 306) In the final scene of the novel, Laura shares a heart-felt moment with her mother in which she forgives her for the effect her illness has had on her life. I definitely recommend this book, and will have some thoughts to share at a later date. I think the main reason I liked this book so much was that I found it to be sooo relateable. This book talks about mental health issues - which I have my own experiences in, and art - which I loved because I am also an artist. I think this book is the perfect summer read, although it tackles serious topics I found it to be quite uplifting. When I finished reading this book it really put me in a good mood. It wasn't just the story I found to be very enjoyable it was also the simple act of reading it. This book it written in verse, and I think that is what plays a large part in making this book sound beautiful. Linda Phillips worded this book in such a way that you really get a sense of what is going on, and feel like you are right there with Laura (The main character). Crazy is a character driven book, (So if you are looking for an action-packed plot driven book, then maybe you are looking in the wrong place)and has some really interesting characters who have left their impressions on me. A perfect read if you want a book to chill out to. Another part I absolutely adored about this book were her figurine descriptions. I think being an artist myself I could really relate to her. I loved reading about how the events in Lauras' life translated into her artwork. They were also beautifully crafted and really came to life when you were reading them. Another quick perk of this book was that it had a Narnia reference - that really made me smile! Although I did really enjoy this book there were a couple of things which bugged me a little. The first, a very small matter, was that Laura called her dad 'daddy' and it did feel as though some of the other dialogue might not have been right for her age (15-16 years) The other thing was that I didn't understand why she liked Dennis so much, I would have liked to get to know him a little better. The last thing I have to say is that if you are apprehensive about the religious aspects of this book, I would say you have nothing to worry about. Yes, religion is a part of this book, but it is still readable to anyone who isn't. It isn't an overpowering part of this book, and is written in a way which adds to her character and to the interest. From the book jacket - Laura is a typical fifteen-year-old growing up in the 1960s, navigating her way through classes, friendships, and even a new romance. But she’s carrying around a secret: her mother is mentally ill. No one in Laura’s family will talk about her mother’s increasingly erratic behavior, and Laura is confused and frightened. Laura finds some solace in art, but when her mother, also an artist, suffers a breakdown, Laura fears that she will follow in her mother’s footsteps. My rea From the book jacket - Laura is a typical fifteen-year-old growing up in the 1960s, navigating her way through classes, friendships, and even a new romance. But she’s carrying around a secret: her mother is mentally ill. No one in Laura’s family will talk about her mother’s increasingly erratic behavior, and Laura is confused and frightened. Laura finds some solace in art, but when her mother, also an artist, suffers a breakdown, Laura fears that she will follow in her mother’s footsteps. Told entirely in verse, this is a moving look at one teen’s efforts to come to grips with an issue that no one wants to talk about. I was quickly involved in Laura’s journey. Her own ups and downs as a teenager are fairly typical – new boy takes interest but doesn’t call right away, best friend seems jealous, loves art class, babysitting the kids from hell, etc. But what sets her apart, of course, is her mother’s mental illness – a condition no one speaks about or explains to Laura. So she is left to worry and wonder and consider on her own the possibilities. My heart about broke for her as she struggled to understand her mother’s illness and bravely sought answers to her most fearful question: Will I also become like my mother because I also love art? It’s clear that Laura feels very alone with this struggle, but she does have people who care for her – Mrs Grant tries to reach out to her, Dr Goodman comes through with basic, honest information, Mrs Boucher listens and helps Laura find a creative outlet. In an afterword the author states that this work is partly based on her own experiences as a teen in the early 1960s. The result is a very personal, emotional story. I read this beautifully crafted prose in one sitting. I couldn't put it down. Set in 1960's Oregon and told through the eyes of a fifteen year old girl watching her mother's breakdown, this young adult novel is a must for any mental health collection. Laura, a talented artist, tries to cope with her mother's strange illness by purring on a brave face and telling no one. She's alienated her friends from her home problems because she doesn't know what to tell them, for she has no answers. Laura in I read this beautifully crafted prose in one sitting. I couldn't put it down. Set in 1960's Oregon and told through the eyes of a fifteen year old girl watching her mother's breakdown, this young adult novel is a must for any mental health collection. Laura, a talented artist, tries to cope with her mother's strange illness by purring on a brave face and telling no one. She's alienated her friends from her home problems because she doesn't know what to tell them, for she has no answers. Laura instead hides herself in her art, only to one day stop painting because she fears it is what drove her mother crazy. Amazingly well crated in prose, the short poems capture Laura's concern, heartbreak, and confusion. Fantastic read on what it's like to deal with mental health problems and the stigma that is attached with them. For fans of young adult poetry and mental health fiction. I started a few pages like a week ago at the doctor's office and it sat lonely in my purse since then. I became frustrated with the my other current read and remembered the book in my bag. I have never read a book like this one. It is written in verse and it confused me at first, but then I became so engrossed in the story that it just flowed without a second thought to the style. Laura is a 15 year old who is trying to figure out things about herself and her bipolar mother. It is set i I started a few pages like a week ago at the doctor's office and it sat lonely in my purse since then. I became frustrated with the my other current read and remembered the book in my bag. Laura is a 15 year old who is trying to figure out things about herself and her bipolar mother. It is set in the 1960's in Oregon when mental illness wasn't talked about and not much was known about it. Although it is fiction, it is based on real events and people. And you can tell. There is such truth in every page and thought, she knows of what she writes. CRAZY is a novel written in verse in which the main character, Laura, tries to come to grips with her mother's mental illness and her own fear of inheriting the disease. Set in the early sixties, when such issues where often swept under the rug and misdiagnosed as mere "nerves," Laura doesn't know who to trust or where to turn. Even painting, which has been her refuge, no longer soothes. The language of CRAZY is beautiful and succinct, and I particularly loved the way the verse tied in visually CRAZY is a novel written in verse in which the main character, Laura, tries to come to grips with her mother's mental illness and her own fear of inheriting the disease. Set in the early sixties, when such issues where often swept under the rug and misdiagnosed as mere "nerves," Laura doesn't know who to trust or where to turn. Even painting, which has been her refuge, no longer soothes. The language of CRAZY is beautiful and succinct, and I particularly loved the way the verse tied in visually with Laura’s thoughts. This book resonated with me on a personal level in ways I wasn’t expecting. It gave me courage to take up the art I’d shoved aside for years because I didn’t think I could “get back to that place.” I highly recommend CRAZY; it’s poignant and superbly written, yet wonderfully raw. In a word: INSPIRING. The novel "Crazy" is a coming of age story with a twist. The reader gets to be with Laura while she endures her sophomore and junior years at high school. I instantly connected with Laura because I had to deal with friends and first loves, but where we differ is her home life was much different. Laura's mother was "crazy". Laura is such a lovable character and the reader can connect with her instantly. Phillips has created a story where the reader feels Laura's emotions, which is a great gift fo The novel "Crazy" is a coming of age story with a twist. The reader gets to be with Laura while she endures her sophomore and junior years at high school. I instantly connected with Laura because I had to deal with friends and first loves, but where we differ is her home life was much different. Laura's mother was "crazy". Laura is such a lovable character and the reader can connect with her instantly. Phillips has created a story where the reader feels Laura's emotions, which is a great gift for an author. I couldn't put the book down! I hope I can have the privilege to read a lot more from Linda Vigen Phillips. This book is one of my favorites and I will cherish the time I got to spend with Laura forever. This was my first verse novel, and if they're all this good, it won't be my last. Though this story is set in the 1960s, it has a timeless feel to it. The saddest thing is realizing that the Laura's mother could have had a much better quality of life nowadays. But the mental health profession just wasn't there yet. The lack of understanding and secrecy that surrounded those with mental illness only worsened matters. Laura's fears about her mother and her own future are intimately bound together This was my first verse novel, and if they're all this good, it won't be my last. Though this story is set in the 1960s, it has a timeless feel to it. The saddest thing is realizing that the Laura's mother could have had a much better quality of life nowadays. But the mental health profession just wasn't there yet. The lack of understanding and secrecy that surrounded those with mental illness only worsened matters. Laura's fears about her mother and her own future are intimately bound together and anchored with true and poignant details. What a unique book! The verse is so full of feeling that main character Laura simply leaps off the page, inviting you into the complex and difficult world of familial mental illness that she has to navigate daily. I couldn't help but cheer her on as she demanded answers from family members and started to find ways to heal through her art and her outside relationships. This is a beautiful and meaningful debut from Linda Vigen Phillips. 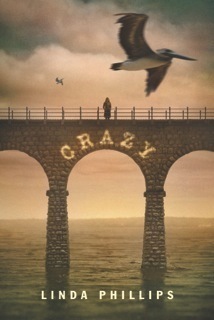 Crazy is a deep, from-the-inside look at mental illness that is both unflinching and yet never veers into melodrama. The author is incredibly generous and kind in sharing this story with readers, and I look forward to sharing it with friends for whom it will be a balm. Thank you for writing it Linda Vigen Phillips. Verse novels are always such a lovely surprise. I love the rhythm and how each poem is both complete and a part of the whole. Phillips does a masterful job creating just the right rise and fall of emotions, hope and despair. Set in the 1960's, this tender coming of age tale of a young girl dealing with her mother's mental illness is as relevant today as it was for teens then. Though generally I would write a scathing review for a book that wasted this much of my time, clearly the author poured a lot of her own true story into this book so I will hold the hate for the next plague in my life. Let's just say this wasn't my cup of tea. It's my SLJ read. The review will be published by them. 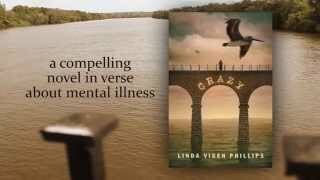 The novel Crazy by Linda Vigen Phillip is an emotional historical fiction novel about Laura, a fifteen-year-old girl going to high school in the early 1960 ’s. While it may at first seem this is a story about an average high school girl who feels lost and while this may be true at school, Laura’s family is everything but ordinary. With her mom’s episodes, while her family ignores, Laura tries to walk through life, while trying to keep all of her emotions to herself. And through her experiences, The novel Crazy by Linda Vigen Phillip is an emotional historical fiction novel about Laura, a fifteen-year-old girl going to high school in the early 1960 ’s. While it may at first seem this is a story about an average high school girl who feels lost and while this may be true at school, Laura’s family is everything but ordinary. With her mom’s episodes, while her family ignores, Laura tries to walk through life, while trying to keep all of her emotions to herself. And through her experiences, Laura worries she will go crazy too. This review has been hidden because it contains spoilers. To view it, click here. A moving semi-memoir novel-in-verse told from a teenage girl in the 60s living a typical 15-year-old's life, but with the terror and uncertainty of her mother's mental illness hanging over her head. No one will talk to her about her mother's breakdowns, treatments, manic episodes, and periods of debilitating depression. While she deals with friendships, academic pressure, her first "crush", she is also weighed down by self-blame and terror that she might inherit her mother's moods. Even her art A moving semi-memoir novel-in-verse told from a teenage girl in the 60s living a typical 15-year-old's life, but with the terror and uncertainty of her mother's mental illness hanging over her head. No one will talk to her about her mother's breakdowns, treatments, manic episodes, and periods of debilitating depression. While she deals with friendships, academic pressure, her first "crush", she is also weighed down by self-blame and terror that she might inherit her mother's moods. Even her art work, which normally give her solace, is now painful. Told in a realistic voice. Easy to read and fast-paced. Laura is a regular fifteen-year-old experiencing childhood in the 1960's, exploring her way through classes, companionships, and even another sentiment. In any case, she's bearing a mystery: her mom is experiencing a dysfunctional behavior. In my opinion, it was a very boring read but had an interesting storyline. I expected more "crazy" things to happen in the novel; underwhelmed. Linda Vigen Phillips was born and raised in pristine southeast Oregon. She left after graduating from U of O but Oregon never left her. She says, "There is a deep-down reservoir in my soul that holds the sound of lake wind whistling through tall Ponderosas, sun glancing off of Cascade Range peaks, the semi-arid wind carrying sage and juniper scent....more renewable resources than any writer could Linda Vigen Phillips was born and raised in pristine southeast Oregon. She left after graduating from U of O but Oregon never left her. She says, "There is a deep-down reservoir in my soul that holds the sound of lake wind whistling through tall Ponderosas, sun glancing off of Cascade Range peaks, the semi-arid wind carrying sage and juniper scent....more renewable resources than any writer could ever need." Linda finds passion in creating realistic fiction told in verse, to offer hope to teens and their families who face mental or physical health challenges. Her debut novel, Crazy, depicts the struggles of a teenage girl in the1960’s coming to terms with her mother’s bipolar disorder. It earned numerous accolades, including Foreword Reviews lndieFab Book of the Year Finalist, the short-list for SCBWI Crystal Kite Award, and an Honor book for the Paterson Prize for Books. Linda’s second book, Behind These Hands, shows how the life of a teenage piano prodigy is upended when her two younger brothers are diagnosed with Batten, a rare neurodegenerative disease. Linda’s writing has been praised as “beautiful” and “emotionally impactful” (School Library Journal); her brave storylines “resonate with teens” (Booklist) and “speak to many, many readers” (San Francisco Book Review). Linda enjoys conducting writing workshops, spending time with her grandkids, and advocating for better mental health through her involvement with National Alliance on Mental Illness (NAMI). She lives in Charlotte, NC, where she and her husband love to sit on the screened porch to watch the grass grow. about having a weirdo mother.